We use sodium sulphite or ammonium bisulphite which, although more expensive, is easier to use and has a much more extensive buffer effect. Three applications are widely encountered: boiler water treatment, conditioning cooling closed circuits and conditioning secondary recovery water (oil fields). Chromium is mainly present in IWW as a trivalent or hexavalent. Chemical removal of total chromium takes place in two stages: hexavalent chromium is reduced into trivalent chromium that precipitates as a hydroxide. The usual forms of hexavalent chromium: chromate ion CrO42–, dichromate ion Cr2O72– and chromic acid H2CrO4. Table 42 lists the different reduction methods together with the theoretical amounts of pure reagents involved. The most widespread technique involves sodium bisulphite. before discharging or recycling gas from ozone utilisation applications. The reactions take place quickly in such a way that, in drinking water distribution systems, the contact time available in the pipelines will suffice. The amount of reducing agent dispensed is governed by the residual chlorine content. Upstream from reverse osmosis, a slight excess of reagent is being used at present (approximately 20%) in relation to stoichiometry. Note: Sodium thiosulphate must not be used upstream from reverse osmosis because there is a risk that mineral sulphur will form (resulting in the modules becoming fouled) through a thiosulphate decomposition secondary reaction (dismutation). In the case of boiler water, chapter treatment and conditioning of industrial water describes the physical and chemical treatment conditions (nature of reagents) used. 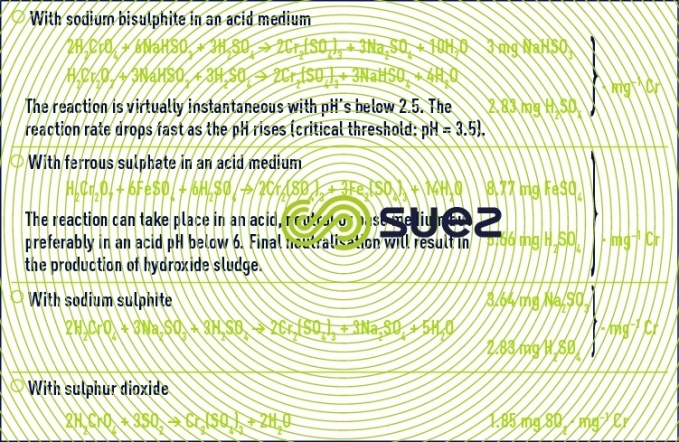 In agri-food industries, pure anhydrous sulphite (or ascorbic acid under exception conditions) is normally used. Activated carbon can be used in dechlorination applications. Contact time in the columns tends to extend to a few minutes (see section main adsorbents). This technique is mainly used in the beverage industry or upstream from demineralisation lines. It is not recommended upstream from reverse osmosis: danger of bacteria proliferation, discharge of fines. destruction by incinerating the activated carbon. There are many catalysts that are suitable for breaking down ozone. The most conventional formulations concern manganese dioxide and palladium deposited on alumina. Catalysts operate at temperatures of between 50 and 70°C in order to avoid inactivation caused by the condensation of water contained in the gas to be processed. iodide or bromide that produce free iodine or bromine capable of acting as a disinfectant, especially in swimming pool water applications.